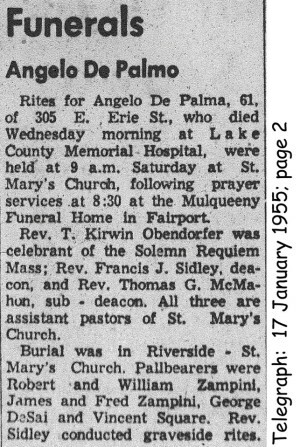 Arcangelo DePalma first appears in the Painesville, Ohio, area in the mid 1920’s. In America, Arcangelo DePalma was known as Angelo DePalma. Arcangelo DePalma, son of Luigi DePalma, was born on October 20, 1893, at Lateria, Italy. He married Mary Zampini, daughter of Egidio Zampini and Maria Giuseppa DiIorio, on July 12, 1945 at Painesville, Lake County, Ohio. 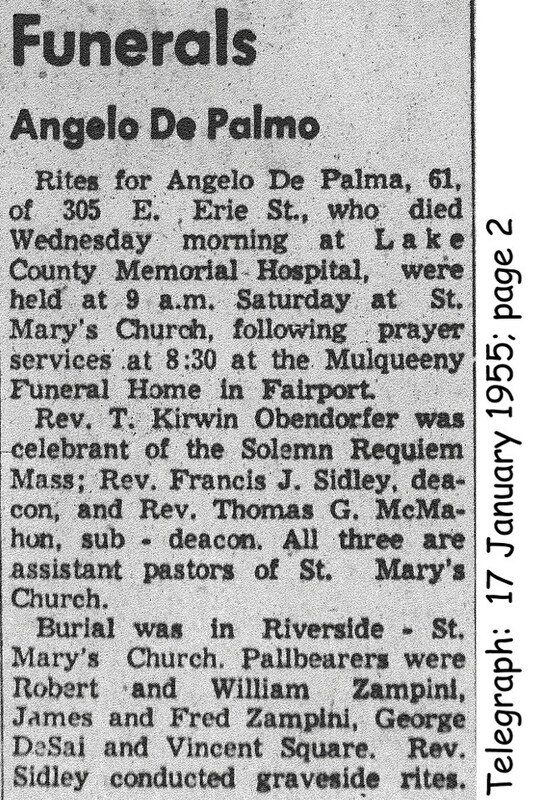 Angelo died on January 12, 1955, at Lake County Memorial Hospital at Painesville, Lake County, Ohio, at age 61. Arcangelo DePalma, age 17, immigrated to the United States on April 8, 1911, travelling to New York City, New York. He migrated to Painesville, Ohio, sometime before 1928. Angelo DePalma was enumerated for the 1930 Census of the United States, on May 6, 1930, living at 256 Sanford Street, Painesville. He was a roomer of Filippo Venditti. Angelo De Palma became a citizen of the United States on August 18, 1950. Angelo resided at 305 East Erie Street, Painesville, Lake County, Ohio, when he was Naturalized. 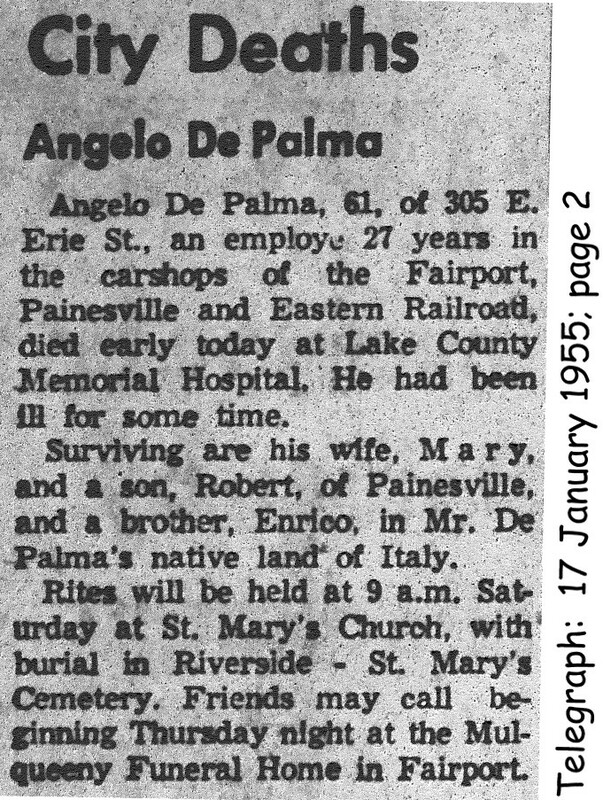 At the time of death, Arcangelo resided at 305 East Erie Street, Painesville, Lake County, Ohio. 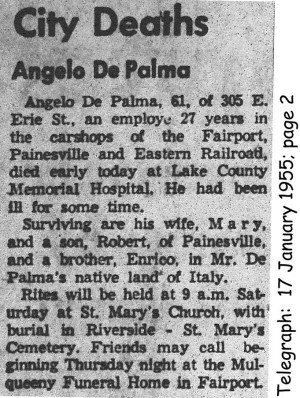 Angelo was employed for 27 years at the Fairport, Painesville, and Eastern Railroad.